What Day Of The Week Was December 24, 1897? 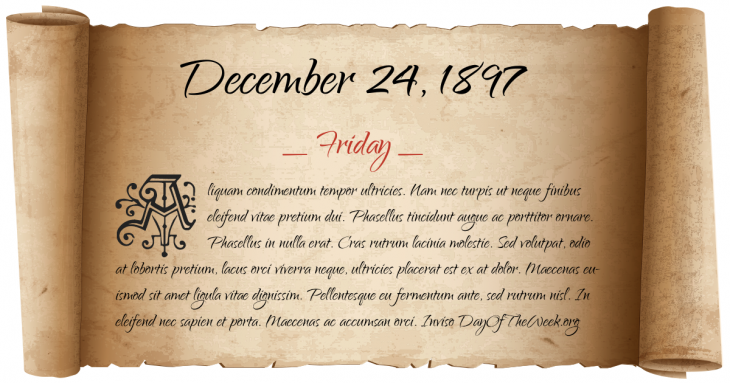 December 24, 1897 was the 358th day of the year 1897 in the Gregorian calendar. There were 7 days remaining until the end of the year. The day of the week was Friday. A person born on this day will be 121 years old today. If that same person saved a Quarter every day starting at age 4, then by now that person has accumulated $10,713.75 today. Here’s the December 1897 calendar. You can also browse the full year monthly 1897 calendar. Capricorn is the zodiac sign of a person born on this day. Turquoise is the modern birthstone for this month. Onyx is the mystical birthstone from Tibetan origin that dates back over a thousand years.